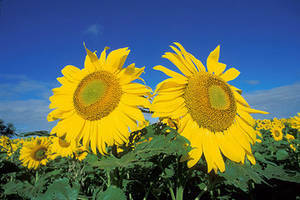 Description: Free picture of two large sunflowers in a field of smaller sunflowers. They are bright yellow with a beautiful blue sky in the background. Photo taken by Bruce Fritz for the U.S. Agricultural Resource Service.